New look, new HTML and, of course, new fonts. What do you think of Runaway In LA's revamped facelift? I decided to opt for a clean, streamlined look that not only fuses feminity but also maturity, as I hope to one day nurture my blog into a professional project (translation: snagging a dream job as Rumi Neely). And as always, Runaway In LA is not complete without a hint of Disney essence (speaking of, I am tragically suffering through Disneyland withdrawals). Today, I'll be sharing with you all my winter essentials. As a seasoned New Yorker (or so I wish to be), I now finally know what an authentic winter feels like. Gone were the overcast sixty degree afternoons that had been my Southern California winters. What pleasantly greeted me instead were malicious winds that tore at my bare (and naive) hands and the ocassional downpour of delightful rain that drenched boots and unveiled hair. And for the first time since elementary school, I experienced the wondrous beauty of snow. In fact, just last evening, I innocently departed the Met, noticing strange flakes in the sky. At first, I mindlessly thought it was rain. However, the sudden flourish of iPhone cameras proved me wrong; it was not just a mundane plague of rainfall, but snowfall. And naturally, I decided to have a photoshoot amidst the flurry of delicate snowflakes. And I didn't even stop there: I proceeded to record my view of Fifth Avenue in a true winter glory that usually is only reserved for classic holiday films. Now, that, my friends, is how you distinguish a New York transplant from a true native city dweller. However, to be caught in my first New York snowfall in the Upper East Side of all places? I wouldn't trade it for anywhere else (well, I'll make an exception for Arendelle in Frozen). 2. KNEE-HIGH SOCKS - NYU kids are the satorial masterpieces. They manipulate dresses into shirts, camoflauge themselves in a fusion of fur and leather, and most importantly, embrace the art of acessorizing. From the Parisian chic beret to the glamour of the faux-fur collar, I have witnessed the various ways students have chosen to accordingly furnish their cold-weather ensembles. One of the most popular choice weapons for this winter are knee-high socks; whether worn with ankle boots or riding boots, they provide an extra dose of warmth, especially when layered over tights or leggings. On rare days when the city is transformed into a haven of divine sunshine, knee-high socks are displayed solely with ankle booties, flowy skirts and floppy hats for a much-needed bohemian-meets-streetstyle vibe. 3. ANKLE BOOTS - Confession: I used to utterly despise ankle boots. Standing at only 5'1, I had always lived my wardrobe life under the impression that ankle boots further emphasized my short frame. However, I fell into a lethal trap of the trends and became poisoned with the thought of purchasing a pair when I began to see girls everywhere, on the streets, in my dorm, during class, rocking a pair of effortessly-cool ankle boots. Having been enchanted by my MissGuided black and rose-gold ankle boots, I have realized that they do not only elevate you to new heights with three-inch heels, but look wonderful when paired with skinny jeans and leggings. Currently, I am in a lustful affair over black Doc Martens, as I love the gritty, model off-duty essence of them. 4. COLORED DENIM - Apologies to J Brand, True Religion and 7 For All Mankind. These days, I have chosen to abandon your classic American blue-wash in preference for a more diverse option. It is strange to think that I have rarely worn a pair of blue denim recently; usually, I like to rely on my black spandex leggings or my colored denim, ranging from rose-pink, mint, oxblood and mocha hues. I can't quite place it, but there is something purely so exciting about color denim over the average pair of dark-wash skinnies. Still on my wishlist? Patterned jeans. 5. DENIM SHIRTS - Perhaps a better term for this delectable desire of mine would be chambray shirts. In the past, there used to be a cherished H&M chambray button-down that graced virtually every outfit of mine; however, my darling denim beauty eventually lost its color and began to fade after a few laundry washes, eventually leading to its catastrophic demise. Now, I am again, on the search for a new denim shirt to join the coterie. I am particularly looking forward to pairing my denim shirt with a faux-fur vest for a polished yet feminine look. 6. PHILLIP LIM x TARGET BAG - While fashion-conscious women of the world quietly froze outdoors whilst waiting in line or sat wide-eyed and caffeine-quenched by their computer screens, I was most likely catching a few zzz's in bed. When the much-coveted Phillip Lim for Target collection launched back in September, wallets were raided of its contents and credit cards were swiped mercissely as everyone rushed to snag their favorite handbag. Tragically, the nearest Target near me is all the way uptown in Harlem, in which I was not going to make an effort to go early in the AM. However, I'd still like to get my hands on my own prized Phillip Lim for Target bag... preferably without an $100 pricetag. 7. DAINTY RINGS - It only took one disasterous decision to realize that statement rings are not the most pragmatic accessory choice for the winter season. Yes, while I dearly cherish my tribal ring from Rings & Tings that mysteriously resembles Loki (which thus reminds me of the most beautiful man on earth: Tom Hiddleston *swoons*), these oversized rings do not become your camaraderie when worn with gloves or mittens, often getting caught in the fabric. As a result, I have resorted to the realm of dainty rings; these delicate and subtle rings are small enough to not become a hassle when worn with thick fabrics but eye-catching enough to remain as crucial accessory pieces. Plus, the look of stacked rings adds a new element to an otherwise plain and drab monochromatic uniform. 8. BEANIES - My blogger friend (and intern-queen) Mallory Levy once told me that New York would change my style. Who knew that such a concrete jungle could change my style? Back home, I would not have even batted a mascara-kissed lash at the thought of beanies. But, nowadays? I seem to have somehow developed a ravenous appetite for beanies; not only are they ridiculously warm, but adds a casual-cool twist to any ensemble. And for those who suffer from the tragic case of bad hair days, beanies are a pratical choice for shielding second-day shine and pesky fly-aways. After seeing Sarah Hyland rock a Mickey Mouse beanie for her birthday and having discovered this same product at an Urban Outfitters store in Boston, I have since vowed this precious item to be on my Christmas wishlist... but of couse, I'm open to your classic white and gray too. 9. BLUSH - Note that I rarely wear blush. The last time I sported a pair of rosy cheeks was when I got my make-up done professionally at a Sephora for prom. Since then, I have been meaning to scour the shelves for the perfect blush, but have been either too unproductive to properly search or unfortunately broke to properly purchase. With the winter season dawning upon us, blush is a wonderful way to add a neccessary dash of flushed rose to an otherwise pale complexion. In other breaking news: I have officially purchased new camera lens! Be on the look-out for my upcoming outfit posts, which hopefully, will be enhanced in quality. 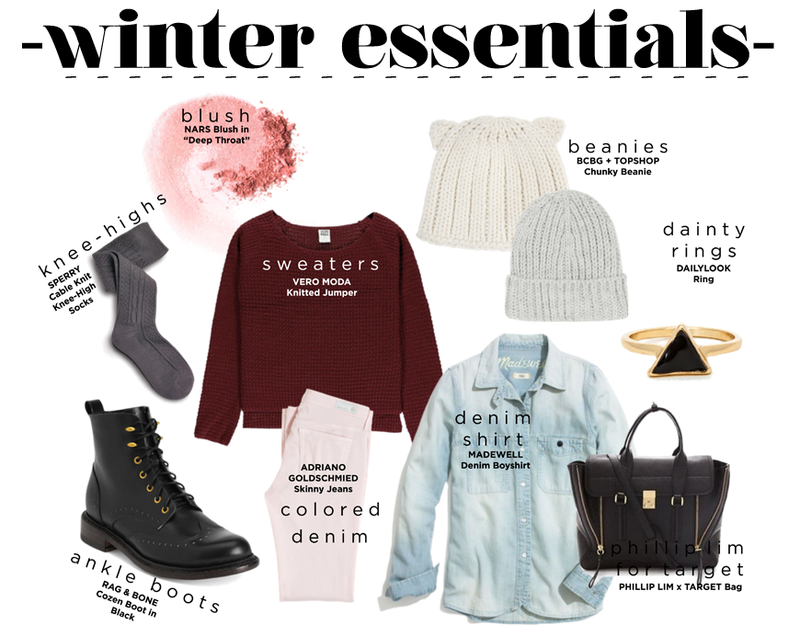 Hope you have enjoyed a peek at my winter essentials! Now I want to know... what are your own winter must-haves?